Lehenga Sarees a traditional wear of India. It is three-piece flared attire. It is an attire, which closely-fit like hugging around the midriff to hemline like a skirt. The flare helps to cover ugly curves of the bulky body and support to avoid the difficult situation. It is a Long skirt starting from the waist around the bellybutton all the way long up to the floor. A blouse/Top is worn over a foundation garment with it. The length of top depends upon wearer’s body structure and styling. The third part is a dupatta (stole/scarf) to drape around the neck or shoulder. It is a favorite one to the women who don't like to wear saree isn't their favorite outfit. 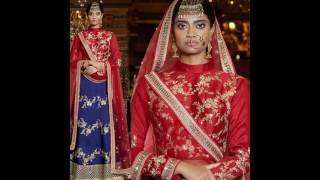 Lehengas entered as an exclusive outfit with the arrival of Mughals. United India wasn't unfamiliar with the concept. Rajasthani Ghaghra choli was a common outfit worn by the royal emperors and family of them. Women's of the Mughal royal family had a good sense of styling costumes. They used to wear embellished outfits with the heavy elusive & complicated work. Floral Patterns embroider with the pure gold thread along with motifs and beads. Now, lehengas are Must and should for every fashionable woman with any body shape. You can buy designer Rajasthani ghagra style lehenga from various online shopping stores with Low price. Lehengas have distinct their inscription in almost every occasion. Not only in India but almost all next-door nations, regardless of belief or occasion. It is a well-accepted women's outfit of Asian women around the globe. Lehengas are well known as a ready to wear outfit. It is not necessary that every style of lehengas suit every body type or shape. Generally, Indian women’s body structure is dissimilar. This is the coz of the ascended need for different styles, shapes, patterns & designs of lehenga. Existing wide range of styling is the result of demand for various styles. Indian readymade lehenga choli dresses are in high demand at online with heavy sale and demand from UK & USA. India is a multicultural country & people follow different rituals as per cast, religion or region. If you compare metro cities lifestyle and countryside lifestyle there is a vast difference. The Indian wedding wear for marriages and other festivals are different. There are so many communities In India they still believe in wearing the traditional maroon color sari (Panetar). They continue to follow their belief. Indian designers have developed two types of traditional lehenga blouse design. Simple and party wear designer Lehenga cholis, both attires have their own importance. Small town’s girls prefer to wear simple lehengas in Big Events. The reason is very simple we don’t have any trademark costume for events. Latest lehengas for the party are popular among all. Modern girls living In Big cities prefer to wear Indo-western lehenga choli due to the western effect. 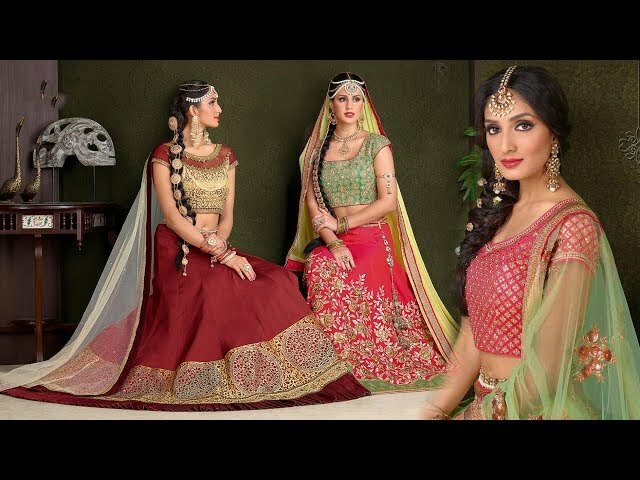 Women's Simple Looking New Styles Lehenga Choli Design With rich look are in demand For Teenagers coz of the attractive price range. Layered lehenga jacket design comes with less but beautiful work. It comes with many layers. Those layers may be two or more. The layers may be long or short. Those layers may come with beautiful digital print or work. Each layer contains some unique & crafty works. It contains crafty & thread and metallic yarn Hand embroidery and cutwork. It also comes with pearl, crystal, glittery diamonds, patch, sequins, smoke, motif work. The border of the last layer is 100% visible part of the lehenga. It is best and broad worked part of the whole set which beautifies the attire. It is most suitable for summer season. A-Line lehenga comes with a skirt designed in the shape of "A". It is fitted at the waist and reaches the hem making flared cone shape. It gives trilateral or “A” or umbrella shape to the body. It is an appropriate alternative for pear-shaped ladies. Wear it with a stylish Blouse. Couple it with long & delicate hanging earrings and an appealing Pigtail pony touching the waist. Women with a bit bulky body shape can go with A straight cut lehenga without much worry. It is also suitable for short heighten body shape. It drops straight from the waistline without embracing much to lower end of the body. This drop style adds illusive height to the wearer that helps her to look slick and slim. Anarkali lehenga has enormous flares like a skirt with pleats (Kalis). It starts exactly from the waistline. The more the Kalis the lovelier the lehenga, the fuller the imprint it gives. 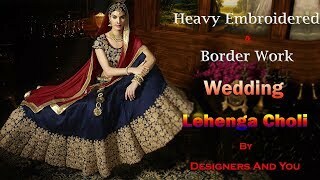 If you have a standard body shape then You can select multi-layered globular lehengas. Short Ladies must avoid this type of lehengas. Girls with the slimmer body must go with large pleats, which add weight to the look. It is also well known as a Panel lehengas. If your body is hourglass shaped then Fishtail or mermaid lehenga Chunni will suit you. Lehengas fits from the waistline all the way to laps and extension out at the laps like an angle fishtail. this will highlight desired curves and the edges to show them. The latest trend of Trail style high low (up and down) hemline lehengas is the best fit for a short girl. Trail style came in fashion from Christian wedding gown. The ensemble consists of three pieces, Lehenga choli, and saree. The choli is a top part of the attire it may be long or short depends upon demand. It is well designed with the various types of heavy embellishments and hand works. Assembling of various patterns like neck, collar, back & sleeves beautifies it. The dupatta (Long scarf) is one of the main parts of the attire. The dupatta also comes with heavy embellish and work. The lehenga is a bottom part of the attire. The shape of the lehenga is uneven. The front hemline of the lehenga comes in full length; whereas hemline of the back side is longer than the front. Because of the extra length of lehenga, it trails. The rear hem walk off with swiping the floor like a curtain and the front hem is letting liberty to movement of feet. The jacket style blouse, trail shape lehenga & half saree type dupatta add glamour to the wearer. It is much more comfortable for the winter season. Newest trend attires must have heavy embellishment to divert the attention of envoys. It is a multipurpose-featured outfit. Any age-grouped female can wear it. This is a versatile outfit without any bounds. You can match any type of statement jewelry with appropriate accessories. It is small effort to pass knowledge about what style suits your body type. Today women are smarter after the introduction of the Internet. They visit most popular and famous designers sites. They also keep proper knowledge of their preferred Bollywood celebrity’s outfits styles. They keep a keen eye of what type of new patterns and fabrics introduced in the fashion world. Now they don’t prefer to buy lehenga choli from mall or shops, they prefer to buy online. Western fashion has intersected our traditional wears. The styling of our Chaniyas & Lehengas is Even under impact. Western Style has affected Indian ethnic wear. How our Chaniya choli style can stand away from western fashion wind. Latest Indian fashion trend is shifting towards Indo-Western style. Chaniya with trendy Blouse and new Patterns that is on the hike at Online. Lacha Was In Fashion Of Northern End Of United India. Lacha Is Back In Fashion With Modified Avatar And Combination. Party Wear Lacha Style Lehengas Are Becoming More & More Popular Even In Countryside. Lacha Comes With Somewhat Longer Cholis That Covers The Stomach Back & Hips. Latest Trend Of Indo Western Party Wear Lacha type Lehenga With Long Choli Design Is Favorite Attire Of Teenagers And Best For Girls. The sharara Gharara are contemporary getups, were in fashion till 1980, now part of the Muslim community. The sharara and the Gharara are lower garments that are like flared pants. The sharara is a straight Paijama that looks like a skirt. The Gharara is also a Paijama that is fitted till the lap and then flared. Kurta or Kurti is a top to pair both bottom types. The fashion of Ghagra has opened its wings from Gujarat & Rajasthan to nationwide. Today Latest New Style of Indian Ghagra Saree Dress Design is in demand around the globe. You can also choose a brocket or net fabric combining it with silk or velvet fabric. Color combination, style, neck, back, and sleeves play a major role in beautifying it. Embroidery and other embellishments are also one of the major factors that can add extra glamour.